This is the first graphic novel I’ve read in many years, and it was a great way to get started again. There is a themed package here that makes Lady Killer, as a whole, a great experience. Writer Jamie Rich paints a world of…well, actually illustrator Joelle Jones does that, but Mr. Rich tells the story of Josie Schuller, a gorgeous, stereotypical early 1960s wife and homemaker who trades recipes, gossip, and cups of sugar with other dress-laden neighbors when not out fulfilling missions of assassination, while her husband nor her children have a clue to her actual duties as a hired killer when she’s not in the kitchen. This graphic novel will certainly appeal to those who appreciate the era nostalgically, as well as those drawn to Don Draper and gang in Mad Men–the TV series that took place in said era; a world where women strictly wore dresses and were expected to be nothing but kitchen dwellers, putting to great use the oven that their hardworking husbands purchased with the bacon they brought home day after 9-to-5 day. Joelle Jones’ artwork and attention to detail of that decade bring to life Rich’s story, complimenting it perfectly. Scenes of action involving physical struggles and car chases are well articulated to bring a suspenseful feel to an otherwise inanimate medium. 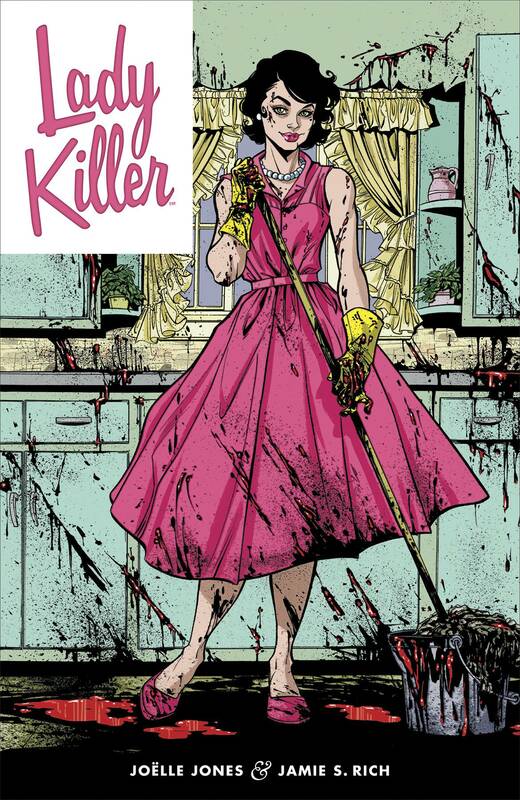 That being said, what makes Lady Killer work isn’t the art or the story alone but a fusion of the two–the retro-style with the culture aptly applied and the creation of Jamie Rich’s characters throughout. Though some may find the group stereotypical in more ways than one, perhaps even predictable, they still work. The lady killer herself is presented in a way that we’re rooting for her soon after the first kill–much like we did with the collection of other recent anti-heroes such as Tony Soprano, Dexter Morgan, and Walter White. Though I’ve only read the first in the Lady Killer series, I did recognize it left a door wide open for much more to be told, and I certainly wouldn’t mind following the trail of blood Josie Schuller leaves in her wake.